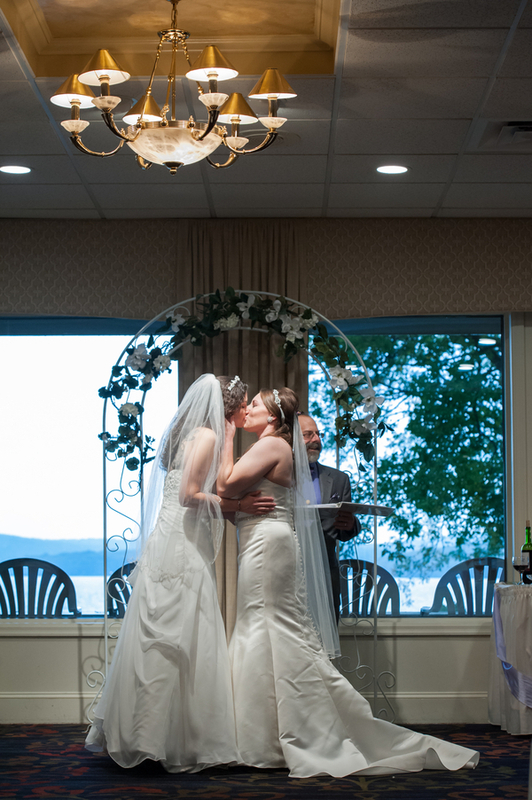 Bridget and Jessica Get Married! 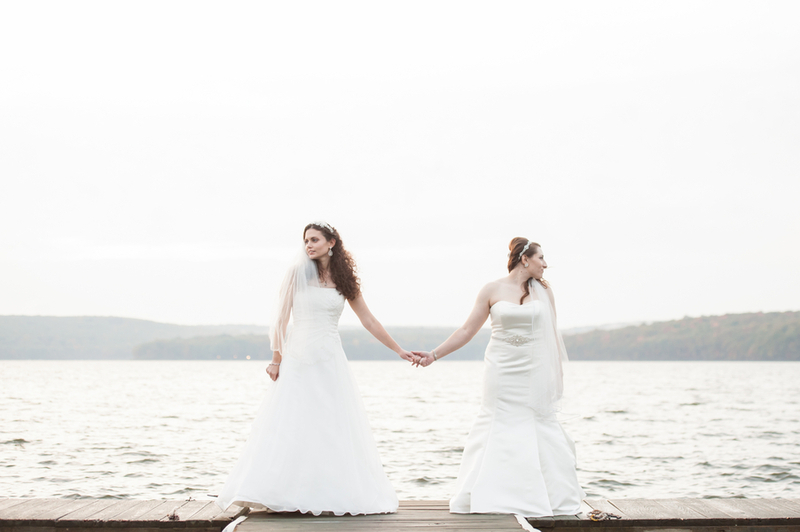 Read this touching true love story about Bridget and Jessica: Our Story… Jessica grew up in Hazlet, NJ and moved to Scranton, PA to pursue her studies at the University of Scranton. She received a Bachelor’s in Exercise Science and Doctorate of Physical Therapy. She now works as a physical therapist. Jessica has been an activist for the LGBT community since college. She currently serves as the Board President of Equality Pennsylvania and as a Commissioner on the PA State Commission for Women. Bridget was born and raised in Dunmore, PA. She attended Marywood University for her undergraduate studies and received a Masters of Creative Writing from Wilkes University. 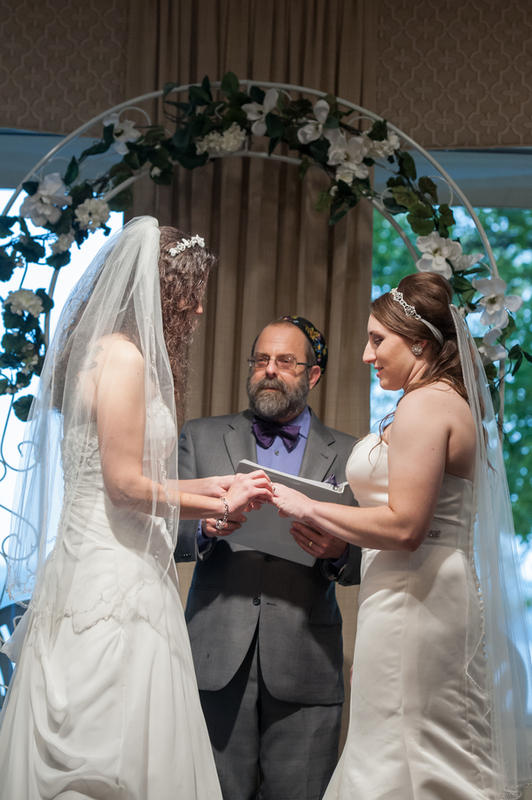 She is an adjunct professor of English and an aspiring author of LGBT fiction. 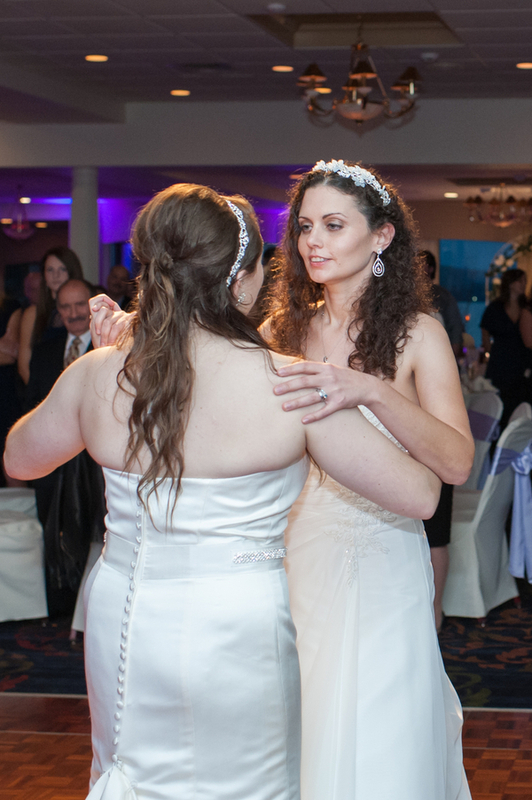 Bridget and Jessica met in the summer of 2011 through a mutual friend. Jessica was just beginning her graduate studies and had asked her friend to introduce them after hearing great things about Bridget. When they first met, Bridget was unaware that she was being set up. Dressed in jeans and old gym sneakers, she wasn’t quite prepared for a blind date. She was quiet and did not seem interested, but they got together again the following night at a local gay bar. After a first kiss on the dance floor, sparks flew and they began dating. They moved in together about two years later and became engaged on June 29th, 2014. Jessica searched for the perfect engagement ring for over 6 months and found a unique blue diamond ring. She wanted to propose to Bridget on the day of the NYC gay pride parade in a park located in front of the historic Stonewall Inn, the setting of Bridget’s novel. However, the park was blocked off for the parade, and it was so crowded that Jessica convinced Bridget to go to the Washington Square Park. She was just about to pop the question, when they were interrupted by a boisterous stranger, killing the mood. Jessica was determined to make the proposal work, so she later got down on one knee while walking along the piers on the Hudson River. Bridget was completely overwhelmed. In shock, she asked, “Is that a ring?” Amid a shower of tears, she accepted. 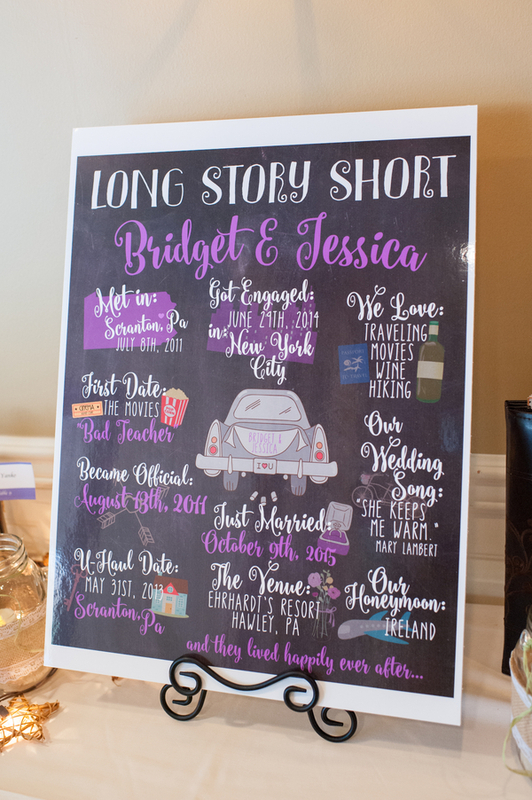 Bridget and Jessica worked on several DIY projects in preparation for the wedding. 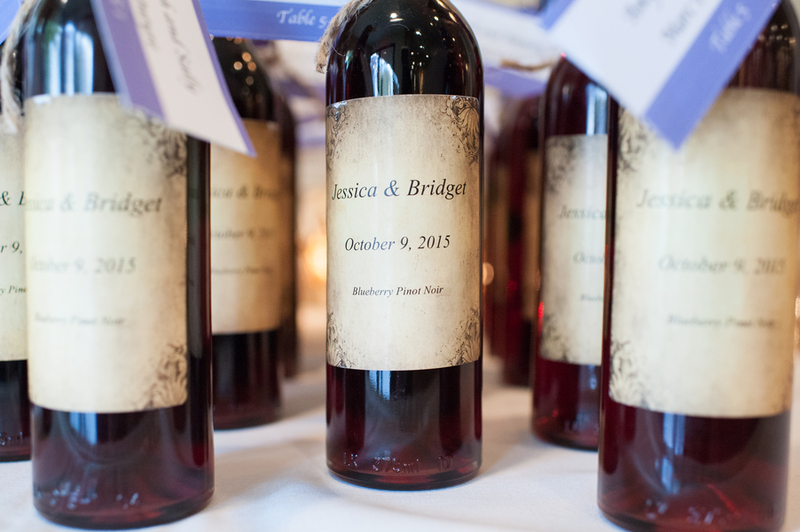 They made their own wine to provide as place card holders, smore’s bags as table favors and personalized ceremony signs. 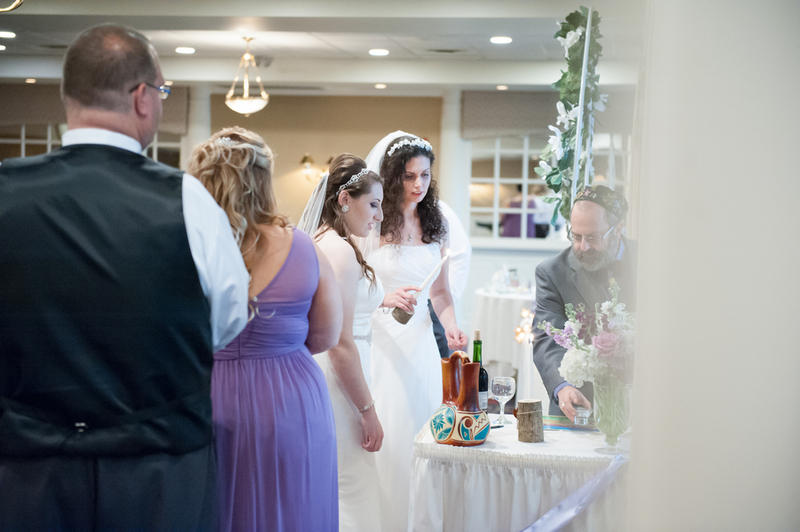 They also created anniversary wine bottles where guests were asked to place marriage advice for milestone anniversaries. 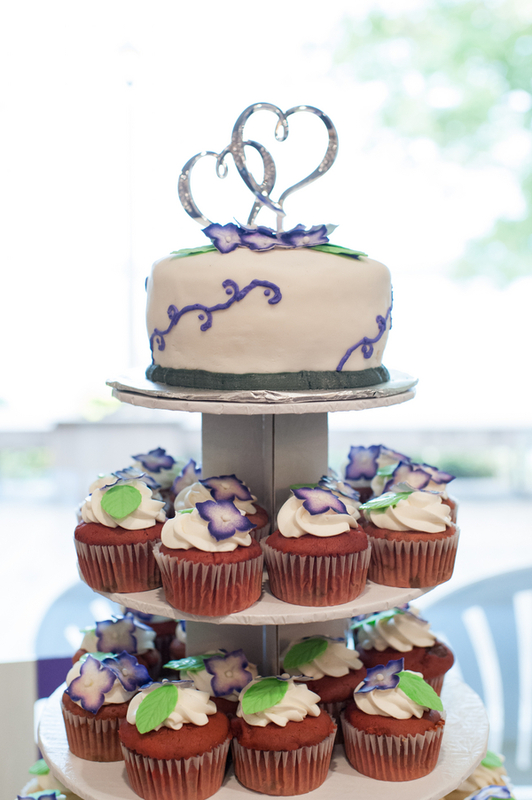 Jessica’s close friend from high school made their wedding cake and cupcakes. 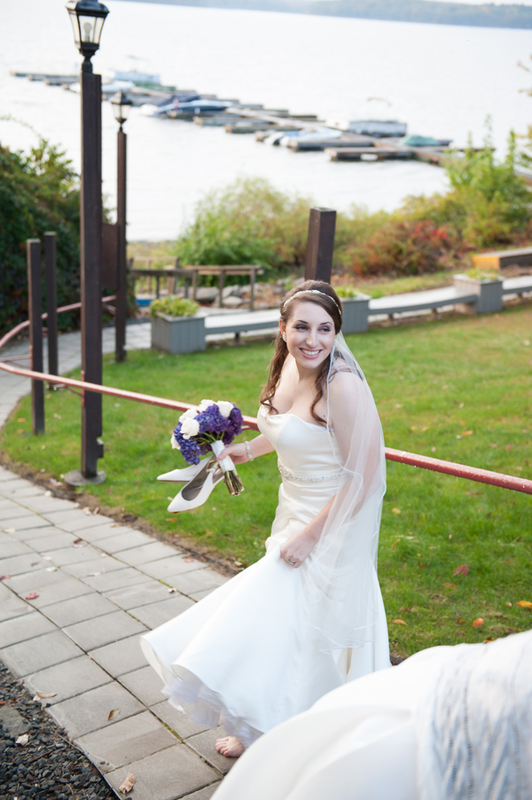 Although it rained on their wedding day and the ceremony was moved indoors, the wedding was perfect and there was a beautiful panoramic view of the lake. 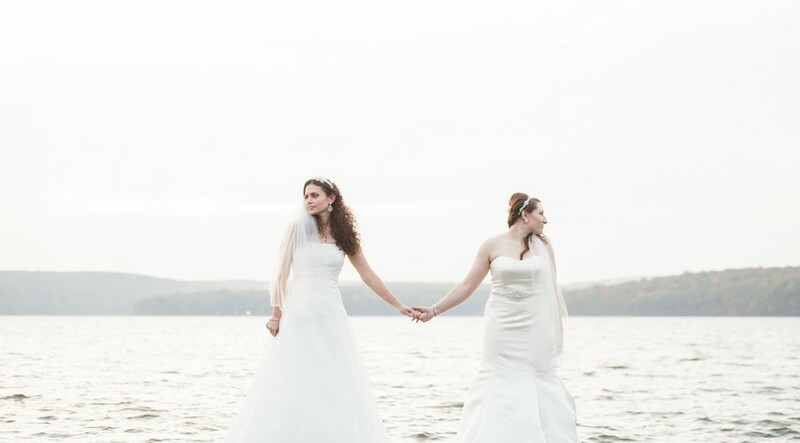 Both Bridget and Jessica agreed that their favorite moment was meeting at the center of the aisle and seeing one another in their wedding dresses for the first time. 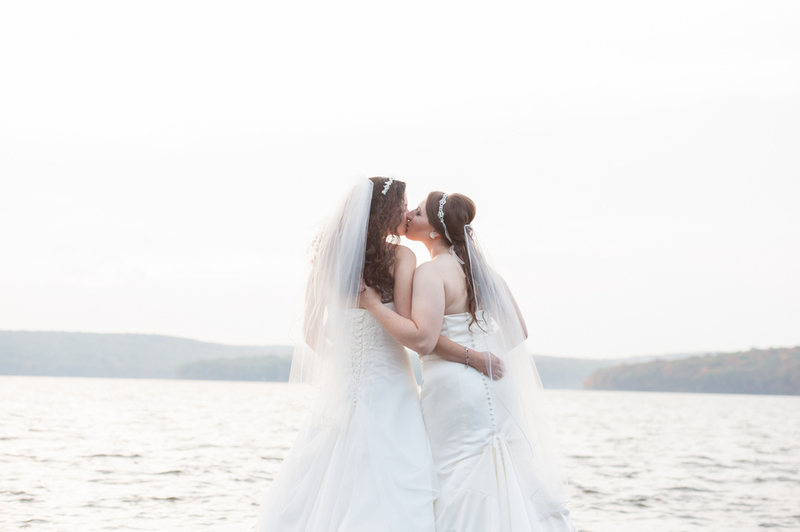 The rain cleared soon after the ceremony, and their photographer was able to capture gorgeous photos on the lake. There was plenty of dancing at the reception afterwards, and many of their friends stayed overnight in cabins. The next day, they were completely surprised when they received a handwritten letter of congratulations from a married couple staying at the resort for their 20th wedding anniversary. Bridget and Jessica left the next day for their honeymoon in Ireland. 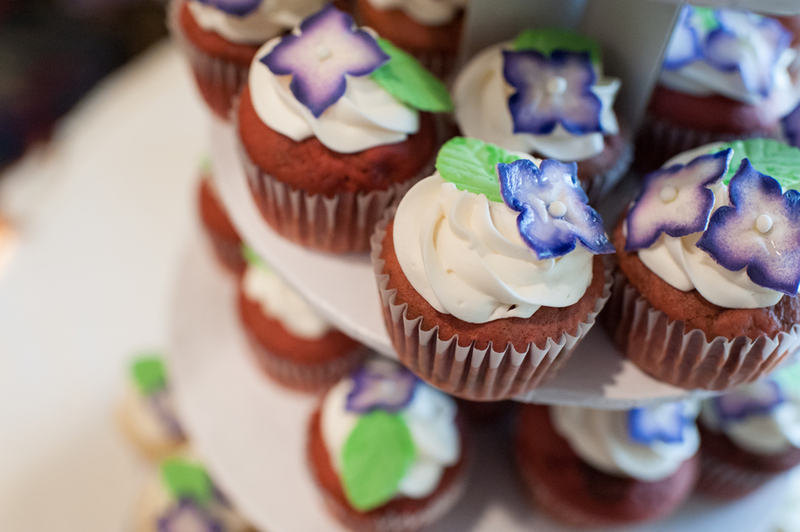 What great wedding photos. 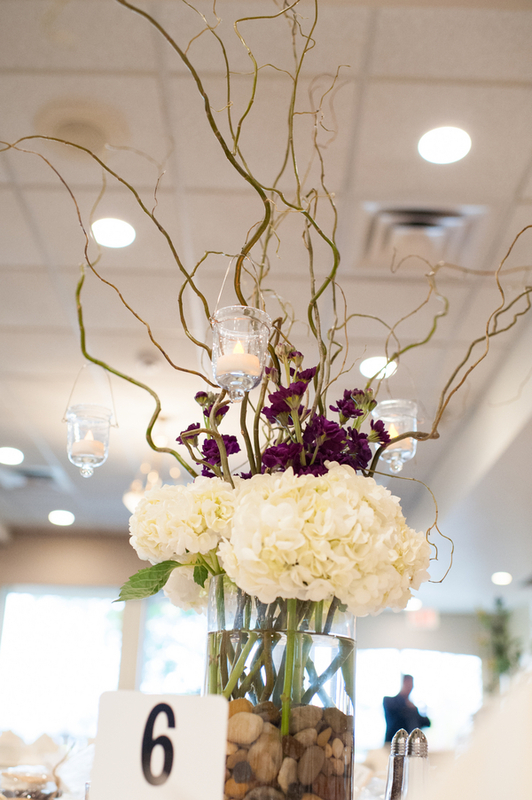 I love all of the pretty details and purple touches.